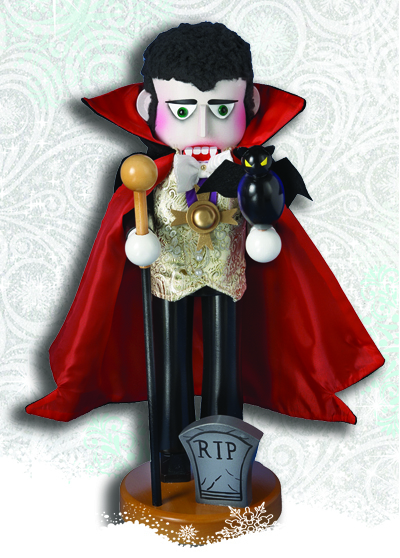 Steinbach is pleased to announce a new series of nutcrackers, the Steinbach Horror Legends Series. Introduced in 2013, this series begins with Count Dracula and will continue down a spooky path, highlighting other major figures from classic horror films. The 1st in Steinbach’s new Horror Legends series, “Count Dracula” celebrates the most classic character in horror film history. 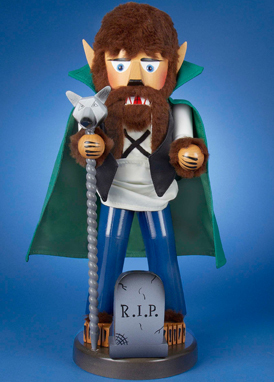 At 17” tall, this nutcracker features a ghostly white pallor, fang detailing, a dramatic collared cape, a bat companion, and a tombstone at his feet. Count Dracula is a limited edition of 5,000 pieces. 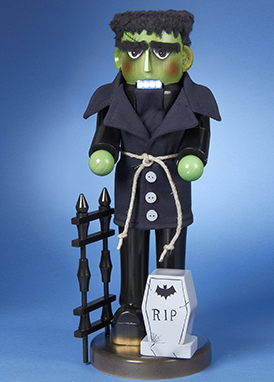 Steinbach’s 16.5” Frankenstein nutcracker is the perfect addition to any nutcracker collection or classic horror collection. This piece is a limited edition of 5,000 pieces. Steinbach’s Horror Legends Series continues with its third design, the Werewolf. His horrific, hairy figure stands at 16” tall and resembles the werewolves of the silver screen. His sharp teeth, furry face, and pointed ears are complemented by a long cape, a silver staff to hearken back to werewolf lore, and a tombstone at his feet.